When September 1 rolls around the blue and white check banners start to make their appearance all over the Chicagoland area. That means it's Oktoberfest time!! There are plenty of celebrations to be had around the Chicago area but these are my recommendations because let's be honest not all Oktoberfests are created equal! The Berghoff boasts the grand daddy of Chicago Oktoberfests, having hosted their almost month long celebration for 33 years. This year there is a special lunch and dinner menu along with multiple nights of music. This three day festival is one of my favorite places to celebrate Oktoberfest. St. Alphonsus' is perfect for the entire family. There are tons of different bands and Kinderfest for the kinder. A yummy looking extensive Oktoberfest menu is what you can find at the west suburban restaurant. They work with the Glendale Heights Oktoberfest but if you're looking to stay inside now that it's getting cooler out Schnitzel Platz is perfect. In it's 6th year this 10 day celebration will definitely pack a punch. There is great food and music every day. One perk of this festival is that you can splurge on a VIP box, with perks like meal vouchers, your own table, real china and so much more it's definitely worth it to upgrade your Oktoberfest. Edelweiss is a northwest Chicago German staple. Their Oktoberfest menu is one of the best I've seen. I think the Edelweiss Platter is the way to go with a little bit of everything that delicious German food. If you're looking for a great family Oktoberfest in the burbs Naper Settlement has you covered. There is all sorts of music from the traditional polka bands to my close friends 'Stache. This is one Oktoberfest that I hadn't heard about before! Who knew you could take Oktoberfest on to Lake Michigan. You get to enjoy a traditional German dinner, live music and dancing plus you get to take home your souvenir stein. Hofbrauhaus makes it their business to give you as authentic an experience as you can get outside of Munich. 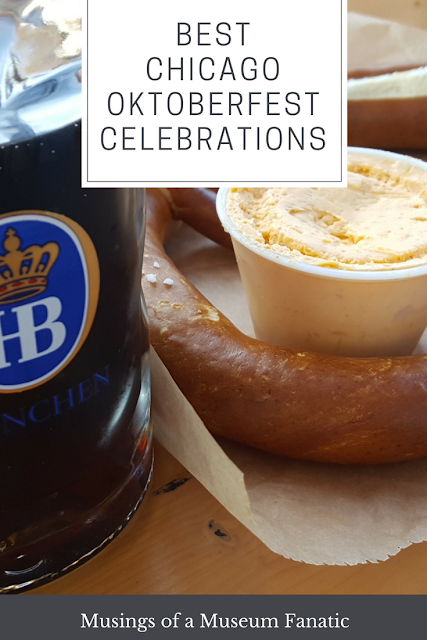 There parades and keg tappings every weekend, daily Oktoberfest food specials, special beer and music you'll definitely want to visit the Hofbrauhaus several times this Oktoberfest!